This is a game I’ve had my eye on for a long time. 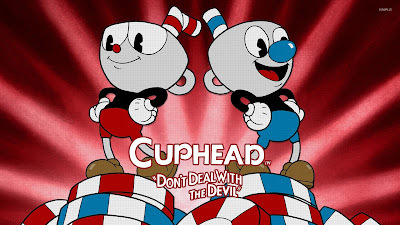 Cuphead has been in the making since 2010. I’m a sucker for nice art and Cuphead is full of it. Every character animation is painstakingly hand drawn, scanned in and then coloured digitally. It’s easy to see why Cuphead was delayed, over and over, but so worth the wait. Created by a team of two Canadian brothers, Chad and Jared Moldenhauer. The brothers both grew up with a fascination of and were clearly heavily inspired by 1930’s propaganda, surrealist and subversive animation by people such as Max Fleischer (Popeye, Betty Boop), Ub Iwerks (Mickey Mouse) and Myron "Grim" Natwick. They soon hired Jake Clark, who also contributed and helped with artwork and animation. By the end of production, they ended with a team of around 20 people working on it. Studio MDHR is going to be one to keep an eye on. 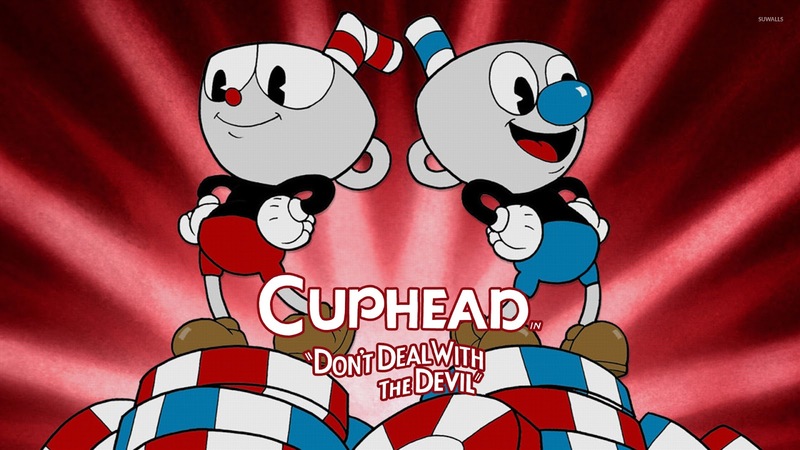 Cuphead and his brother, Mughead, get themselves into a spot of gambling debt with the Devil, at the local Casino.During a game of Craps, the Devil ups the stakes by offering the porcelain pair the Casino; but if they lose, their souls belong to the Devil. Obviously, they lose (Spoilers) and beg for a way out. They’re offered to collect all the souls owed to him (the Devil) and in return, they can keep their own. This is all cleverly conveyed to you in the opening theme song which plays over the Title Screen. There's a level of masochistic trial and error, to Cuphead, comparable to Super Meat Boy and Trials HD. Just like in the two games mentioned, an instant restart helps ease the frustration of constant death. If you had to sit through a loading screen and had time to reflect upon how bad you are, you'd just give up. The short length of the fights (when you get it right) keep you going. You'll die over and over, learning each bosses pattern, dying near the end of a battle and giving it “one more go”. Then you realise you're late for work... but screw work, you need to beat this Boss… you're so close. This game wants you to “get good”, to a clearing Contra on a single life sort of level. There is an “Simple Mode” if you're just wanting to play through to see the amazing work that's gone into the animation and listen to one of the best game soundtracks this year. It still won't make it an easy task, though, and the real final boss is hidden behind the hardest difficulty. Cuphead’s use of 1930’s ragtime, swing jazz is perfect. Kristofer Maddigan did an amazing job scoring the game. Cuphead runs at a smooth 60 frames per second for fluid controls and responsiveness. This is one of the few games using the Unity engine to show that with the right people coding, Unity is powerful free software. Akin to the likes of Super Meat Boy, If you get hit and mess up, you know it was your own fault (ninety percent of the time, anyway). Cuphead is ruthless and unforgiving... but fair. Personally, I preferred using the D-pad, over the analog stick. At first, the default button layout seemed a little weird but the controls are quite smooth, once you get to grips with them. If you're playing on PC you can remap them to however you want to. I hear moving the *Dash* to a shoulder button helps. There are three main level types. The Run and Gun, which plays a lot like a less chaotic Contra or Metal Slug. These break up all the boss battles. For fans of R-Type and Ikaruga, there are Shmup like levels, where Cuphead fights bosses in the form of a plane. Boss Battle make up the majority of the game, with 19 in total. As I've already mentioned these are extremely hard but massively satisfying each time you beat one. Every boss has several stages of attack, often changing appearance and attacks with each one. If you can find another person, who doesn't mind suffering with you, they can take the role of Mughead for some couch cooperative play... until one of you rage quits.